The girls have continued exactly where they left off. Their previous reunion in 2006 - in a career full of ups and downs - resulted in 'Studio 1', an album that flopped commercially but has since gained cult status. The girls are known for their edgy R&B sound, but they've always managed to adapt to current trends: here it resulted in the hip-hop style of Chick Fit and the ska-influenced lead single Rocksteady. With 'Red Flag', that remains as true now as ever. Initially it sounds like a striking throwback. 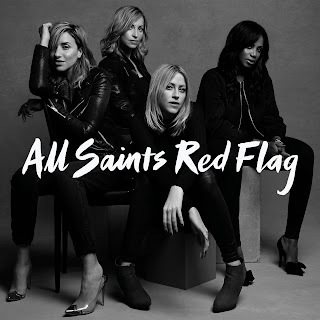 Those voices sound immediately familiar: Melanie Blatt's strong lead, the husky depth of Shaznay Lewis, and added harmonies from the Appleton sisters. And there's that ineffable sense of cool. The girls were always positioned as anti-Spice Girls and their darker, grittier aesthetic is as captivating now as it's ever been (just minus the crop tops). More so, there's a sense of experimentalism here - something else the girls were always known for, with Pure Shores especially. It's the sort of thing that was rife in the 90s and that pop music nowadays often shies away from. One Strike opens the album in stark fashion with its reversed samples and cold, dry beats; it's followed by One Woman Man, all moody bass, heavy percussion and dramatic strings. Later there are the sinuous melodies of the title track and its oscillating synths and, best of all, the tribal beats, lush harmonies and world music feel of the appropriately named Tribal - a polished mixture of Moby meets William Orbit. This experimentation also launches the girls into the present, even if they occasionally misfire. The abrasive Ratchet Behaviour is a step too far into reggae material that feels a little out of place, whilst some other tracks fail to make much impact. Nestled in the centre though is Puppet On A String that adds dancehall rhythms for a sound that successfully pairs All Saints old and new. It helps that the girls have worked with producers past and present - K-Gee and The Invisible Men amongst others. The emotional core of the album, though, is Who Hurt Who, a song that directly addresses the girls' past. "Did you ever think we'd get on better now we never have to worry", they sing in the chorus. It's been fifteen years since the girls first broke up, but 'Red Flag' - their most consistent album to date - proves they're stronger than ever. Listen: 'Red Flag' is out now.